Can you identify each of these typical Northwest scavengers? Bonus points if you can name which one is the top dog (at least for a few minutes). We'll reveal the answer at the end of this story. Photo: Matt Orr. This past winter we completed the fifth year of our study to investigate the feeding behavior of golden and bald eagles at carrion using remote cameras known as camera traps. Our interest is to better understand feeding rates of eagles on carrion, which is a likely source of lead fragments that eagles ingest, eventually poisoning them. 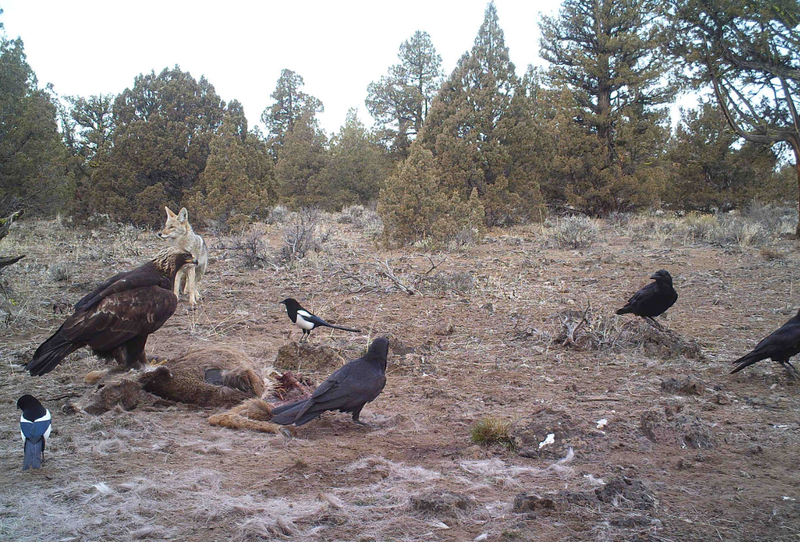 We are working cooperatively with Dr. Matt Orr, a researcher at Oregon State University conducting similar research that emphasizes the importance of ravens in finding carrion and attracting other scavengers. Even when ravens arrive at a carcass before other scavengers, they may have to wait to eat until someone with fangs or a sharp beak and talons opens the carcass. Scavenger pecking order may be determined by who has talons or fangs, but sometimes it's determined by who is the biggest or hungriest. Could you name all the members of the scavenger squad? More on that in a bit; after all, there are other photos from our study worth a closer look. 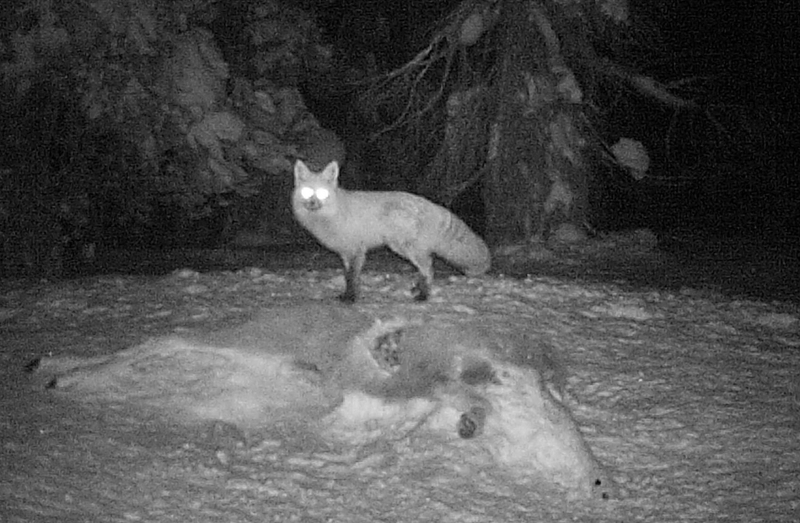 As you can imagine, sorting through thousands of photographs and recording data can become pretty laborious, forcing the poor biologist to take a break every now and then to rest their eyes and back, but feeding behavior by scavengers at a carcass is a 24/7 activity. 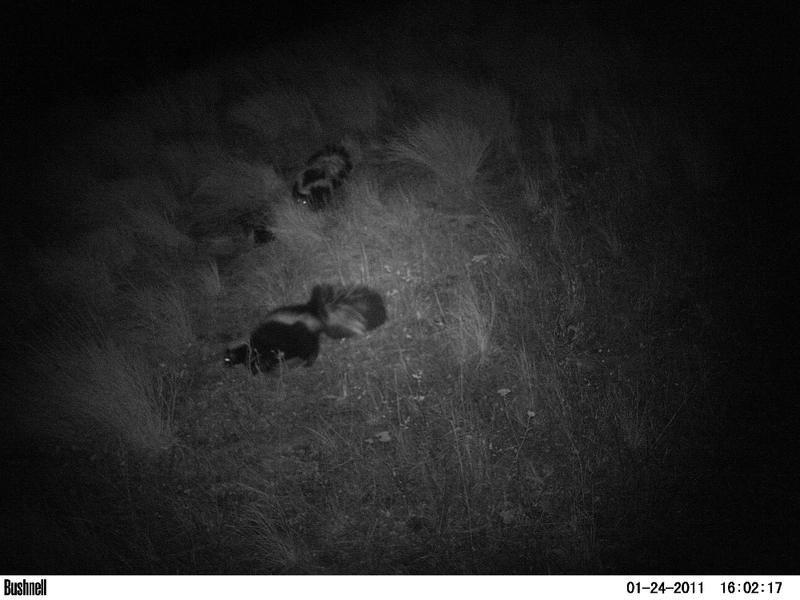 When the sun goes down, diurnal birds go to roost, but a lot of scavengers are just becoming active. This means that the carrion left on the ground at the end of the day may be gone in the morning. 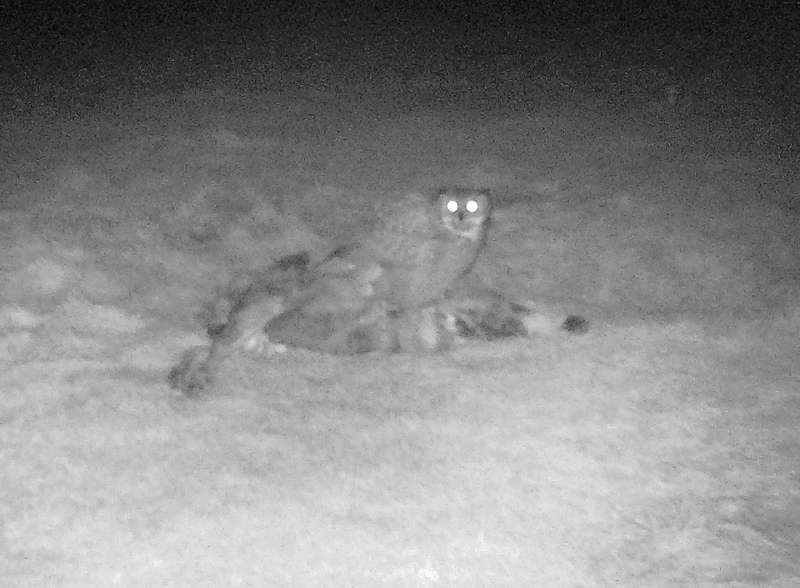 Sometimes the animals that scavenge at night can be surprising, but glowing eyes and bushy tails are a dead giveaway. Back to the pop quiz: here are the members of the scavenger squad revealed, with the golden eagle in its place as top dog over the carrion. Washington Department of Fish and Wildlife and Woodland Park Zoo collaborate on work being done by Research Scientist Jim Watson, focusing on golden eagle territories affected by 2014 and 2015 wildfires. That research includes information on the condition of nests, prey and habitat. In addition, Jim is looking at the effects of lead contamination on golden eagles, as well as juvenile and adult golden eagle movements and range use. 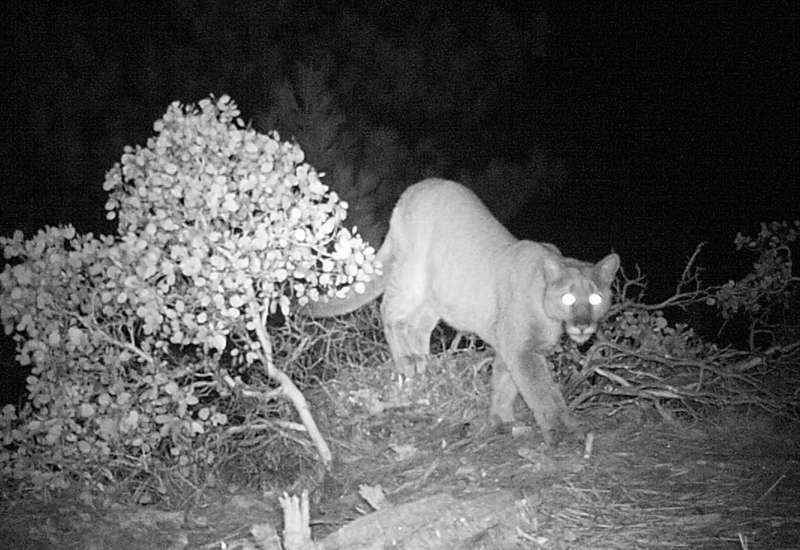 The research is part of Woodland Park Zoo’s Living Northwest conservation program that links animal conservation, health and sustainability in our bioregion.